I used to have a well-earned contempt for French cinema, the only exceptions being the films of Claude Chabrol. However in the last few years, I’ve either been getting old or it seems that French film-makers have been attempting to make movies for audiences outside their usual target. It’s hard to imagine Alexandre Aja’s Haute Tension or the TV series Spiral as anything other than a reaction to the earlier cultural isolationism. Even more unlikely was the recent French adaptation of Harlan Coben’s typically American novel Tell No One. Hard on its heels comes a similar edgy thriller, Pour Elle, retitled for the English-speaking world as Anything For Her. 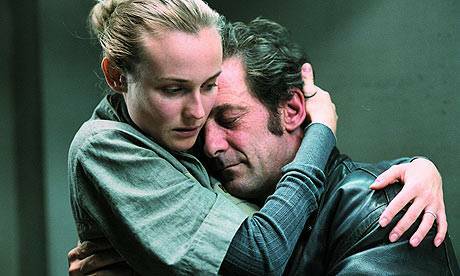 Vincent Lindon stars as a middle-aged dog-eared teacher who is inexplicably married to Diane Kruger, more famous as Helen of Troy. After Kruger is jailed for murder, apparently unjustly, Lindon works on a plan to free her. postit The main point of the plot seems to be to demonstrate how difficult it would be for a normal respectable citizen to involve himself in the criminal underworld, where no-one can be trusted. Lindon is completely convincing in this regard, becoming even more dog-eared after getting out of his depth and getting a good kicking. Eventually he comes up with a plan and the question is not whether his wife is guilty- she isn’t – but how can he free her and start a new life with their son. Anything For Her isn’t the most plausible story, but Fred Cavaye ensures that it rattles along without giving you too much time to question various events, and films most scenes as if they were action scenes. Lindon and Kruger appear mis-matched but manage a fair bit of chemistry to convince you to invest some emotion in their fate. Even if you don’t like subtitles, or French films in general, you’re likely to find Anything For Her a watchable and involving thriller. This entry was posted in Movies and tagged Euro. Bookmark the permalink.